A racy little number is this brand new 2018 BMW M240i Coupe. Motorsport badged and rearing to go, this small sedan is a hot runner! With a power-to-weight ratio that will bring on the smiles, the new M240i is powered by a turbocharged, 3.0-liter inline-six cylinder motor with 250 kW and 500 Nm of torque – which is quite a bit for a little car. It’s not porky either, and is said to weigh in at around 1590 kg. 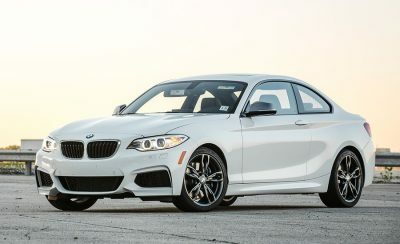 Hop into the driver’s cockpit, and the BMW M240i feels pretty spacious. You’ll find that the special feeling is there with the element of style and luxury all in attendance when you drive a premium brand like BMW. I like the lay out; the dash has a compact, curvy appearance with all the switchgear right at hand. The HD touchscreen is excellent and provides access to numerous top quality features. Premium materials and quality craftsmanship are top shelf. You can choose between various colours and trimmings to make your BMW M240i your very own personal expression of what is a highly desirable sports car. You will enjoy the leather sports seats in the front; they are superb, and come with beautifully patterned premium leather covering, and they are embossed with the M logo. What’s it like in the rear seats? Ok, it’s not going to be lavishly spacious, but it will accommodate a sizeable adult snugly. If you’re over six foot, then you’ll be hoping the journey is on the short side, as head and leg room will be tight. That said, the actual rear seats are nicely upholstered with premium leather and are sculptured to offer a good level of comfort and support. If you’ve got a young family, then there will be plenty of space for the kids in the rear seats. So, the equipment in a new BMW M240i is really good. Climate air-conditioning, a reversing sensor and camera, satellite navigation (upgrades available), BMW iDrive, a quality sound system, Bluetooth connections, Smartphone charging, adaptive cruise control, Emergency braking and a whole heap more. Safety kit includes Driving Assistant with Approach and Person Warning with a light city braking function. Pedestrian detection and Lane Departure Warning, Active Cruise Control and Speed Limit Info allows you to be in full control of your speed choices. Park Assist makes the parking lot way easier. It comes with the five-star safety approval! You’ll be surprised at how the M240i can store all your nick-knacks easily. There are large bottle bins in the doors, a centre console with plenty of storage and the glove box, too. Cup holders are present front and rear, so the car is set up nicely as a practical little sedan for a small growing family. If your kids get into the six-foot stage then it might be time to move up to 3-or-5 Series Beemer. What about the boot space? You have 390 litres under the lid, so the M240i has 30 litres more than the 1 Series hatchback’s cargo space and 10 litres more than the Volkswagen Golf’s. 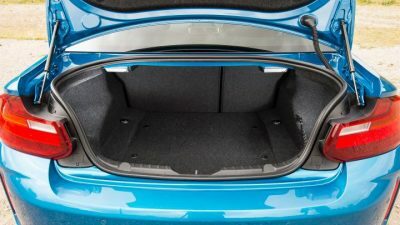 You might find that the actual boot opening is a little narrow for getting huge suitcases inside, but it is a sports car more than an MPV, isn’t it? It also compares well with the boots of the Audi TT (292 litres), Toyota GT86 (237 litres) and Volkswagen Scirocco’s (312 litres) which means that your racy wee 2 Series Coupe is a convenient travel companion. Nets, tethering points and a 12 Volt socket are nice additions to the boot space. Fold down rear seats make carrying capacity and functionality that much more practical, too – giving you a range of options. There are some great features that standout on the new BMW M240i. It comes with a remote phone link for pre warming the cabin, checking on where abouts the car is, how much fuel you have, and you can even send your destination points to your satellite navigation remotely. 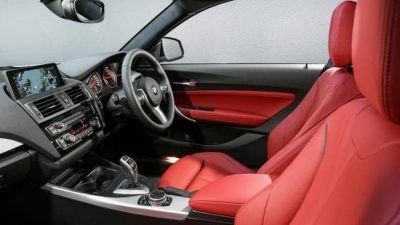 Strong connections in a modern sports/luxury car are absolutely essential. Whether for arranging appointments, checking emails, planning journeys or enjoying your favourite music, the modern BMW ConnectedDrive technologies are the best and can be controlled in various ways including by voice command. Apple CarPlay is standard. You have the option of RWD and AWD which is excellent. I love the extra grip that the AWD offers this quick little sedan, just because! RWD is fine, but AWD sounds a bit sexier – if you know what I mean. It also means that you’ll easily match a WRX or Evo challenge. So, yes, the new BMW M240i is fun to drive! There is great engine response and tons of acceleration and power on tap. BMW chassis gurus have done a wonderful job –again- to get a magical, involving driving experience. There are no let down areas here. The M240i comes with damper control for various driving modes. Ride quality is excellent for a small sports sedan. And, the car is very happy just to waft quietly and sedately about should you feel the need when your Mum is in the car. Brakes are more than capable of hauling you in quickly from high speeds. A 0-100 km/h sprint takes around 4.5 seconds and you have an electronically controlled top speed of 250 km/h. Take off the gentleman’s agreement and you’ll easily see 280 km/h on the right track. It’s not the most frugal beast, but then who cares. It is what it is – simply awesomely fun and exciting to drive – and dig the engine growl! Power is put through to the road via the clinical 8-speed sport automatic which has to be about the best powertrain in this class of car. 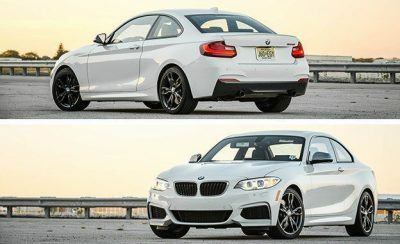 Get yourself into one of these great looking M240i coupes. You won’t be too disappointed! For any more information on the 2018 BMW M240i Coupe or, for that matter, any other new car, contact one of our friendly consultants on 1300 303 181. If you’d like some fleet discount pricing (yes even for private buyers! ), we can submit vehicle quote requests out to our national network of BMW dealers and come back with pricing within 24 hours. Private Fleet – car buying made easy!